Just picked up the Ansel Adams 400 Photographs. Very nice AA reference. Also picked up the Antarctica The Global Warning. There is a style to this book that is remarkably cool. Maybe it doesn't match the real Antarctic but it sure looks cool. Some of the scruffiest looking penguins I've ever seen. The last on is more local to me. Craig Blacklock's Minnesota North Shore. A tremendous treatment of Lake Superior and the Minnesota arrow head region. Very nice. I'd say more, but I gots to eat. 20% the first, 40% off the second and 25% off the third book. Thanks. I'm planning on picking up the AA book one of these days myself, along with the Frans Lanting tome (after I can find a place to rent a forklift). I really enjoyed the Ansel Adams book. As someone who likes that type of work but was only familiar with his more famous images, it was really interesting to see such a broad overview of his career, going all the way back to some of the first photographs he made. The reproduction quality is pretty good especially considering the price. Each "period" is introduced with an essay, would have liked a little more depth in those but at least they provide some context for the images. Another recent purchase of mine was the John Sexton retrospective "Recollections: Three Decades of Photography". Excellent reproduction quality, the texture and tonality in his images is incredible. Haven't had a chance yet to read the essays in this one yet. Those were really good discounts. I might get the books too. I know what you mean about scruffy penguins. Sometimes animals in the wild don't get food on a regular basis because of low numbers of game or changes in weather patterns, or they may have diseases (no regular visits to the vet) etc. I was in Australia six months ago and noticed that some of the kangaroos in the wild were a lot scruffier than the ones in the zoos. It was kind of sad. There's only so much Photoshop can do for scruffy animals (or people)! I have been enjoying Edward Burtynsky's book "Manufactured Landscapes", and the DVD documentary about him and his work, of the same title. Had been "away" from photography for awhile, and just "discovered" his stuff last month. Recommended. After veiwing Michael's interview with Clyde Butcher in the LLVJ several months ago I had the opportunity to visit Clyde's gallery and darkroom in Venice, Florida. Later I had the opportunity to meet him at a presentation on Amelia Island in Fernandina, Florida. His work is wonderful as was Ansel Adams' work. Two of Butcher's books I have purchased and enjoyed are Clyde Butcher Living Waters - Aquatic Preserves of Florida and Clyde Butcher - Nature's Places of Spiritual Sanctuary. I suggest a visit to http://www.clydebutcher.com/ for a sample of his work. Thanks for the tip. Very nice work. I kind of dropped out af being "serious" about photography in 1994, and have just over the last year started in again. Coming across all kinds of neat work. Sorry -- I continue to have problems using this forum with firefox (and then forgetting about that!). It leads to hang-ups when trying to post (and what does go through is a garbled mess!!). If you EVER get the chance to see his prints in person, take it! I have the good fortune to live in Toronto and have seen his touring Manufactured Landscapes and his 'Before the Dam' work at the AGO, and then the rest of his China series when on display at a private gallery (Nicholas Metivier). They have a great impact in the books; but, nothing compares to standing beside his giant, flawless, prints (some 8' or more). I quite like Clyde Butchers stuff. I need to see what he has for books. I keep getting caught up in buying a big print but I never have the cash laying around. To get back to the soul of his work, world-renowned photographer Jim Brandenburg sets himself the task of taking only one photograph each day for the ninety days of fall. The landscape he chooses is his home - the boreal forest of northern Minnesota. The images that result are quietly provoking. It is pretty interesting. He clicked the shutter once each day for 90 days. There is also a great DVD about this, too. Got the DVD a while back and loved it. Interesting with his commentary. He also did another book about the summer solstice period called "Looking for Summer". And if your interested, Mr. Brandenburg is going to be a featured speaker at the TCACCC spring break in Arden Hills this March. Oh! How could I forget looking for summer. That is a great book. I've got a print of the Day 69 photo on my wall. They are 128 pages, small and compact at 21cm x 21cm (8 1/2 inches square) and retail here in Oz at $14.95. I'm not sure when they'll be released internationally, and there'll be a couple of weeks delay for the first two to get back on shelves while they get reprinted. It has been a wonderful but tragically bittersweet experience to have our first books published with Debra losing her 14-year long battle with breast cancer just 3 weeks before we received our copies. I personally feel that she was one of the finest nature photographers working in Australia the last decade. Even more impressive that she lugged around medium format, then Canon 5D system, while being so hampered by the physical deterioration brought on by that horrible disease. But this is her wonderful legacy, and I hope the first of many more from the spectacular body of work she has left behind. If anyone is interested in seeing some of her work, please visit our badly-in-need-of-updating website. Thanks all for your indulgence at this shameless plug. You have my greatest sympathy for your loss. Please let us know if the books become available on the top half of the planet. 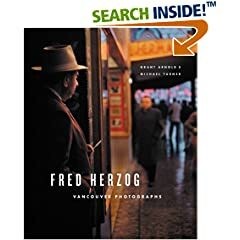 I highly recommend this one; I bought it recently after seeing his (Herzog's) work at the Vancouver Art Gallery. An immigrant from Germany who settled in Vancouver, he photographed the city from the 1950s through 2000 using Kodachrome, but for years he refused to print his work because he was not happy with the color rendition in prints as compared to slides. With the advent of fine art inkjet printing, he finally agreed to have them printed--hence the exhibition. His photographs are mostly of people in their urban setting, although there are many notable still-life type photos, most notably Three Radios. They all have a relaxed naturalness to them, and many are historically interesting, while others are outright hilarous. Thanks Mike & DP for your condolences. We certainly have lost a very special woman and a very special photographer. I'm just now returning to the world after three months hiding in the dark recesses of grief. DP, I certainly will let everyone know when and where they they'll be available up top. Thanks once again for yoiur thoughts.